Ethnic Khmer from South Vietnam are seeking an apology and recognition, to little avail. Marching in the Cambodian capital of Phnom Penh to mark the 23rd anniversary of the Paris Peace Agreement – the country’s national day – between 800 and 1,000 protestors delivered a petition to several embassies and the UN’s offices, accusing Cambodia’s ruling party of failing to adhere to the spirit of the peace accord. Venerable Soeun Hai, one of the protest leaders told reporters, “the rally is to urge the government to fully implement the agreement for the sake of peace, national unification, democracy, development, independence and sovereignty and territorial integrity.” Still, none of the protesters went to the Vietnamese embassy, for fear of confrontation with the Cambodian authorities there. The Vietnamese embassy in Phnom Penh has been the site of a series of protests in Phnom Penh recently, all steeped in historical grievances. Earlier this month, a five-day protest was organized in Phnom Penh by the Khmer Kroms, ethnic Khmer from South Vietnam entitled to Cambodian citizenship. It was at least the fourth of its kind since June 2014, and yet it was not repressed by the authorities despite the demands of the Vietnamese government. Hundreds of monks and nationalists gathered in front of the Vietnamese embassy and called for a boycott of Vietnamese products until Trung Van Thong, a spokesperson for the Vietnamese embassy to Cambodia, apologizes for a comment he made on a radio program last June. Thong had stated that an area in southern Vietnam that was once part of the Khmer Empire belonged to Vietnam “long” before France’s official transfer of the land in 1949. Unlike the protests of Cambodian garment workers asking for a higher minimum wage, these protests are not as easy for the authorities to put down. When the Cambodian government does try to repress them, they are seen as submitting to the will of Vietnam. When it doesn’t, it shows how politically sensitive the issue is. Kampuchea Krom literally means “the lower land of Kampuchea.” “Krom” in Khmer also means “below,” and denotes the “southern” part of Cambodia. Known as Cochinchina during the era of the French protectorate established in the region, Kampuchea Krom is home to Ho Chi Minh City, the largest city in Vietnam. However, little is known about the region in the post Angkor era – a period from around the 15th century until the mid-19th century. This makes determinations of which country has a stronger historical claim to the area extremely difficult. What is clear, however, is that on June 4, 1949, the decolonization process began in Vietnam, and France started its official transfer of the land to Vietnam. According to the statement by Thong, the Vietnam embassy spokesperson: “France did not cut a territory of Khmer Kampuchea Krom and give it to Vietnam, but Kampuchea Krom had been Vietnamese territory for a very long time, and the news of (Cambodia) losing the territory has no basis or evidence.” A Khmer Krom protest followed the statement in July. The Vietnamese embassy in Cambodia condemned the protest, calling it an attempt to interfere in the sovereignty and internal affairs of Vietnam. “Southern Vietnam (Kampuchea Krom) is an integral part of the territory of Vietnam, in compliance with international law, fully recognized by the United Nations, international organizations and all countries in the world,” the statement said. Today, ethnic Khmers in Kampuchea Krom are more focused on keeping their culture and traditions alive than on seeking sovereign territory. Still, there is nowhere they can call home. In fact, Khmer Krom are leaving Vietnam and Cambodia because of the discrimination they face in both countries. In Vietnam, Khmer Krom traditions and religion are at stake because “assimilation” is the norm for all 54 ethnic groups living in the country. And in Cambodia, it is usually very difficult for them to get Cambodian nationality, although the Royal Government of Cambodia (RGC) considers that Khmer Kroms to be Khmer. Ang Chanrith, the director of the recently registered Minority Rights Organization (MIRO), has been working with Khmer Krom in Cambodia since 1998. He told The Diplomat that more than 200 Khmer Krom were given refugee status in Thailand because of the difficulties they face. The UNHCR, the UN Refugee’s agency, assesses their asylum claims on an individual basis, as with asylum-seekers from other countries. Since the agency does not break its statistics down by ethnicity, religion, or other such categories, it is impossible to state how many Khmer Krom are official refugees. By the end of 2013, however, there were more than 100 people of concern to UNHCR from Cambodia living in Thailand. Although the recurring demonstrations do not make the headlines outside Asia, the plight of this ethnic minority group – shuttled between Vietnam and Cambodia since the 1950s – has political implications for both countries. Dr. Jean-Michel Filippi, a professor of Khmer Studies at the Royal University of Phnom Pen, points to the deportation of Khmer Krom monks who criticized Vietnamese politics too loudly as an example of the political impact in the last few years. “In fact, the current leadership already did everything possible to undermine the question and will continue to do so. Should the political opposition win, things would change considerably,” he told The Diplomat. A few years ago, Thach Setha, executive director of the Khmer Kampuchea Krom Community, an association of 12 Khmer Krom organizations, was worrying that the Khmers Krom would disappear through assimilation. But diplomacy and stepped-up activism have changed the outlook somewhat. “In the past, it was very difficult for us to be heard, to demonstrate and state our demands out loud,” said Chuon. “Today, the media makes it easier.” He acknowledges also a tailwind from the United States, as it seeks better relations with Vietnam. “The U.S. pays attention to the discrimination of the Khmer Krom in Vietnam and this is why diplomats and government officials ask Vietnam to improve their human rights record to maintain good relations,“ Chuon said. The United Nations is also showing interest. At the end of his mission to Vietnam last June, Heiner Bielefeldt, the UN Special Rapporteur on the Freedom of Religion or Belief, was concerned by reports of surveillance, intimidation and harassment experienced by some of his interlocutors. His end of mission statement referred to the fact that “[…] some Buddhist monks who identified themselves as ‘Khmer Krom’ would wish to have more autonomy not only within the Vietnam Buddhist Sangha – the sole legitimate religious organization in and outside Vietnam – but also outside of this official Buddhist umbrella.” His final findings from the mission will be released in March 2015. Early this year, during the Universal Periodic Review of Vietnam – all member states of the UN go through a review of their human rights record – a number of civil society organizations submitted information on the Khmer Kroms to the Human Rights Council. Vietnam, however, refused to comment or make commitments during the process. Four months after the radio statement, the Khmer Kroms are still waiting for an apology. “We will hold other demonstrations and would like the Cambodian government to change,” says Chuon. 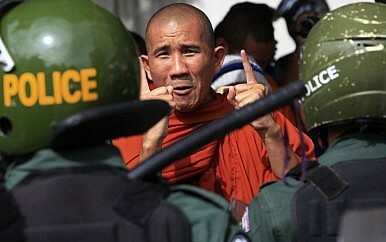 The question now will be whether the Cambodian authorities allow those demonstrations to continue. Clothilde Le Coz is an independent journalist based in Cambodia and covering social and technology topics. History doesn't appear to support claims by the Cambodian opposition to the Vietnamese island of Phu Quoc.